Little, Brown Books for Young Readers, 9780316068703, 224pp. 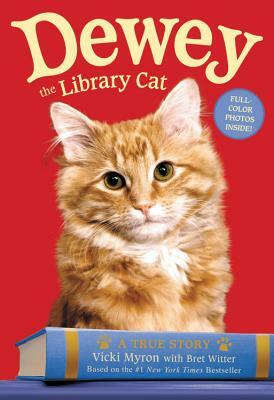 Now everyone's favorite library cat can inspire a new audience of young readers with his story of courage and love. Like the hardcover, this paperback edition of the middle-grade adaptation of New York Times bestseller Dewey features an 8-page photo insert of the Dew! In the tradition of Marley: A Dog Like No Other, this is the story of a cat who was more than a pet, and the amazing effect he had on the people around him. Abandoned in a library book drop slot in the dead of winter, this remarkable kitten miraculously endured the coldest night of the year. Dewey Readmore Books, as he became known, quickly embraced his home inside Spencer's public library, charming the struggling small town's library-goers, young and old. As word of Dewey's winning tail, or rather his tale, spread, the library cat gained worldwide fame as a symbol of hope and proof positive that one small cat could change a town, one reader at a time. Vicki Myron, the former director of the Spencer (Iowa) Public Library, spent nineteen years with the real Dewey Readmore Books, who she rescued from the library's book return drop on a freezing winter morning. This book, like all the Dewey children's books, is based on Dewey's real adventures in the library. Now retired, Vicki lives and writes in Spencer, Iowa, where she continues to be known as "Dewey's Mommy." She invites you to visit Dewey's website at www.deweyreadmorebooks.com. Bret Witter has collaborated with Vicki Myron since 2006 and has enjoyed every minute. He lives in Louisville, Kentucky with his wife and two children.